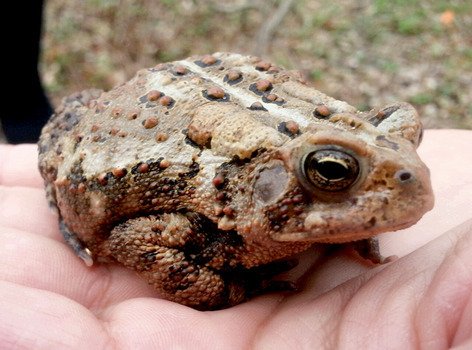 American Toad: Anaxyrus americanus. Body is brown. Skin is dry, warty. Eats invertebrates, including insects, spiders, earthworms, millipedes. Breeds in temporary wetlands, ditches, streams. Tadpoles are small, black, form schools in shallow water. Call is a high-pitched trill. Bullfrog: Litobates catesbeianus. Body is greenish gray or brown. Large external eardrum. Feet fully webbed. Eats invertebrates, including crayfish, insects, worms, snails. Lives in ponds, wetlands, streams. Breeds in permanent ponds. Call is a deep bass sound, "brr-wum,"
Northern Cricket Frog: Acris crepitans. Dark triangle between eyes, green stripe on back. Eats aquatic larvae, insects. Breeds in permanent wetlands and streams with emergent vegetation. Call is like two steel balls clicked together, slowly at first, then faster, "gick-gick-gick." Western Chorus Frog: Pseudacris triseriata. Three dark longitudinal stripes on back. Brown or gray back. Light line along upper lip. Dark stripe passing through eye. No webbing between toes. Eats small insects, small snails, worms. Breeds in temporary ponds, flooded fields, ditches. Call sounds like running a finger over teeth of a comb. Spring Peeper: Pseudacris crucifer. Body is light tan or dark brown. Large toe pads. Eats spiders, ants, beetles, small snails. Breeds in temporary wetlands, shallow ponds, flooded fields, ditches. Call is high pitched, short notes, "peep-peep-peep-peep." Redback Salamander: Plethodon cinereus. Small woodland salamander, short legs. Black or dark brown body. Broad orange stripe extends down back and onto tail. Lives in moist forest, usually found under rocks, logs, fallen bark, or leaf litter. Spends most of its life underground. Lays eggs in June. Eggs are suspended like a bunch of grapes on a rotting log or under a rock. Northern Slimy Salamander: Plethodon glutinosus. Large woodland salamander. Black body covered with silvery white flecks. Secretes white sticky mucous from glands along tail, hence the name "slimy salamander." Lives in moist forest. Lays eggs on roof of underground cavity or rock crevice. 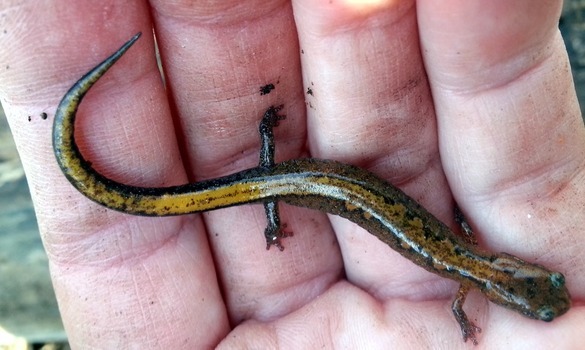 Southern Two-lined Salamander: Eurycea cirrigera. Small thin salmanader. Tan or light yellow body. Two black longitudinal strips run from eyes to tail. Narrow body. Lays eggs under rocks or leaves in or next to streams. 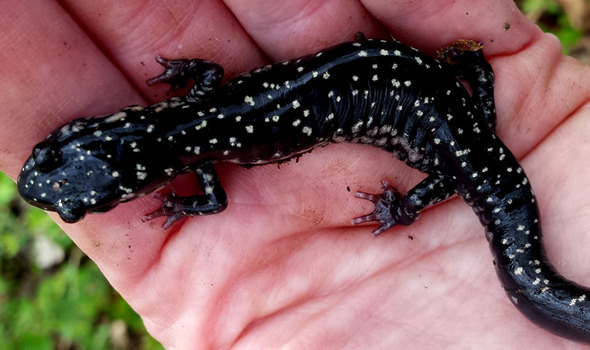 Spotted Salmanader: Ambystoma maculatum. Large woodland salamander. Stout body, wide head. Black body covered with yellowish-orange spots. Lives in burrows or in leaf litter. Nocturnal. Lays eggs on underwater vegetation in temporary ponds.